The Buffalo Bills were off to a slow 1-3 start as they faced the Indianapolis Colts on October 11, 1998. The Bills were in transition as key players in conference-topping seasons such as QB Jim Kelly, RB Thurman Thomas, and WR Andre Reed were either gone or in the twilight of great careers. Marv Levy had retired as head coach and was replaced by Wade Phillips, and the team invested heavily in QB Rob Johnson, who was obtained from Jacksonville and viewed as a young passer with great potential. The Bills also picked up 35-year-old QB Doug Flutie (pictured at right), the diminutive former Heisman Trophy winner who came from the CFL following eight outstanding seasons after faltering in the NFL. Johnson had the starting job and initially struggled, but performed well in an upset of the 49ers the previous week. The Colts were at 1-4 and also won for the first time the week before. Head Coach Jim Mora’s team had a young quarterback of its own in Peyton Manning, the first overall pick in the NFL draft. He had been put directly into the starting lineup and, as to be expected, was struggling in the early going. RB Marshall Faulk was highly productive as a runner and receiver out of the backfield, but Indianapolis was a young team and very much a work in progress. There were 52,938 fans in attendance at the RCA Dome in Indianapolis. Following a short series by the Bills that ended with a punt, and with Rob Johnson having to exit due to bruised ribs suffered when he was sacked on third down, the Colts started with good field position at their 48. Marshall Faulk took off around left end for a 40-yard gain to the Buffalo 12, and after three more Faulk carries picked up seven yards, Mike Vanderjagt kicked a 22-yard field goal to give the home team an early 3-0 lead. 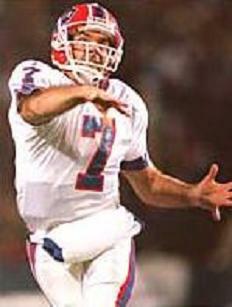 Doug Flutie was at quarterback for the Bills in place of Johnson on the next series and he completed four passes, the longest to WR Eric Moulds for 16 yards. The drive stalled at the Indianapolis 35 and the visitors came up empty when Steve Christie missed on a 53-yard field goal attempt. The Colts went 42 yards in seven plays on their next possession. Peyton Manning completed a pass to TE Ken Dilger for 21 yards on first down to move the ball back into Buffalo territory and a pass interference penalty on a third down play advanced the ball to the Buffalo 18. Once again the Colts couldn’t reach the end zone but Vanderjagt added another field goal, from 33 yards, to put them ahead by 6-0. Following a punt by the Bills early in the second quarter, the Colts put together a nine-play, 54-yard drive that was helped along by a roughing-the-passer penalty on DE Bruce Smith. Manning converted a third-and-nine situation with a completion to WR Marvin Harrison and Vanderjagt kicked a 43-yard field goal, his third, to put Indianapolis up by 9-0. Taking possession with 8:17 remaining in the first half, the Bills advanced 71 yards in nine plays. Five of them were pass completions by Flutie, with three to WR Andre Reed. The third was for 24 yards to reach the Indianapolis six and, two plays later, a scrambling Flutie connected with TE Jay Riemersma for a seven-yard TD. Christie added the extra point to make it a two-point contest. The Colts responded with a scoring drive that included Manning passes to Faulk that covered 26, 11, and five yards and once again ended with a field goal by Vanderjagt, this time covering 41 yards. Indianapolis took a 12-7 lead into halftime, but after dominating play in the first half, the Colts led by only five points. In their second possession of the third quarter, the Bills moved 59 yards in 11 plays. Flutie converted three third downs along the way, with a 20-yard completion to FB Sam Gash while facing third-and-three, a four-yard toss to WR Kevin Williams when again in a third-and-three situation, and the last was again to Williams on third-and-goal for a six-yard TD. Christie added the point after and Buffalo was in front for the first time by 14-12. A three-and-out possession by the Colts gave the Bills the ball at their 43 and resulted in a seven-play, 57-yard drive that stretched into the fourth quarter. The big plays along the way were passes to Reed for 20 and 15 yards, and Flutie had a 12-yard run as well. RB Antowain Smith gained the last four yards for a touchdown and Christie converted. It quickly got worse for the Colts when, on their second play of the ensuing series, Manning was intercepted by NT Ted Washington, who batted the ball into the air at the line and gathered it in to give Buffalo the ball at the Indianapolis 25. Four plays later, it was Smith scoring another touchdown from a yard out and, with Christie’s kick, the Bills had a commanding 28-12 lead with eleven minutes to play. The Colts were unable to get out of their end of the field on the next series, resulting in a punt, and with Smith running the ball five straight times, the big one for a gain of 30 yards, Buffalo was able to add a 39-yard Christie field goal. In a deep 31-12 hole, the Colts fought back as Manning filled the air with passes. A 14-play drive covered 83 yards and resulted in a touchdown pass to WR Torrance Small from three yards out. The try for a two-point conversion failed and Indianapolis remained behind by 31-18. The home team got their next shot with 55 seconds left on the clock and Manning tossed to Harrison for a 25-yard TD. Again the try for a two-point conversion failed, but the outcome was already decided. Buffalo won by a final score of 31-24. The Bills led in total yards (381 to 341), first downs (24 to 21), and time of possession (36:41 to 23:19). However, during Buffalo’s 24-point surge in the second half, the visitors outgained Indianapolis by 150 yards to 28. The Colts also turned the ball over twice, to none by the Bills. Buffalo led in penalties with 9 at a cost of 77 yards to four for 18 yards on the Colts. Doug Flutie was highly efficient, especially in the second half, as he completed 23 of 28 passes for 213 yards and two touchdowns with none intercepted. Antowain Smith rushed for 130 yards on 31 carries that included two TDs. Thurman Thomas gained 23 yards on six rushing attempts and 5 catches for 32 yards while Sam Gash contributed 45 yards on his 5 receptions. Andre Reed also pulled in 5 passes and led the Bills with 76 yards. For the Colts, Peyton Manning was successful on 20 of 41 throws for 235 yards and two TDs while being intercepted twice. Marshall Faulk gained 93 rushing yards on 18 carries and also led the club with 6 pass receptions for 80 yards. Mike Vanderjagt was a perfect four-for-four on field goal attempts. The win for Buffalo marked the second of five straight on the way to a 10-6 record and third place finish in the AFC East. That was enough to secure a Wild Card playoff spot, but the Bills lost to the club that came in second, Miami, in the first round. The Colts were at 1-8 before they won again and ended up at 3-13 for the second consecutive year. However, the groundwork was laid for significant improvement. Doug Flutie ended up having a Pro Bowl year as he passed for 2711 yards and 20 touchdowns, and provided a spark to the offense, although the competition with Rob Johnson proved to be rancorous. Antowain Smith also continued to perform well, rushing for 1124 yards on 300 carries (3.7 avg.) with eight TDs. Peyton Manning played every down at quarterback for the Colts and while he led the NFL by tossing 28 interceptions, he also threw 26 TD passes and accumulated 3739 passing yards, foreshadowing much bigger seasons to come.